The countdown down to the 2010 Homeless World Cup has begun, with the launch of the official commercial helping to build the excitement all the way to the tournament in Rio, Brazil from 19-26 September 2010. The 60-second commercial, which features six-time Grammy award winner Carlinhos Brown, uses animation and street art to highlight the power of football to transform lives. Now in its eighth year, the Homeless World Cup is an annual world class, international football tournament, inspiring 64 national grassroots football projects. It has helped over 30,000 homeless players to change their lives, with over 70 percent of participants experiencing a change for the better. 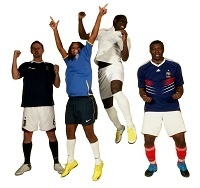 Michele, Patrick, David and Nathan are among them and are now helping to promote the tournament in their roles as Homeless World Cup global ambassadors. Now, having taken part in a commercial which combines live action shot on the streets of Rio and animation of stills from a shoot in London, the ambassadors also have a taste of what it's like to be a movie star, as Club Website found out when we popped in on the London shoot earlier this summer. "It's been amazing," Nathan told us, grinning from ear to ear. "Obviously it's quite hectic because there's a lot to do in a short time and we haven't made adverts before, but it's been amazing." "The other ambassadors each have a different story from mine and just being around them we learn off each other. I can take that back [to the kids he works with in Brighton], use them as examples and hopefully use myself as an example and just pass it on." "They all come from the same place. There are hundreds and thousands of people that have come out of the Homeless World Cup and done something. It's fantastic." Club Website is proud to support the Homeless World Cup. Watch this space for more on the tournament between now and September, including more from the interview with Nathan and the other ambassadors, plus a chat to Homeless World Cup founder Mel Young. Watch. Unite. Celebrate. And tell your mates. Are you in? To find out more on the Homeless World Cup visit www.homelessworldcup.org. To make a donation visit www.justgiving.com/homelessworldcupfoundation.